When or if you were baptised as a baby, your parents and god-parents made promises on your behalf. In the Anglican Church, once you are old enough (and this varies from person to person) you are encouraged to ‘own’ those promises for yourself. At confirmation we say yes to Jesus’ call to follow him on our journey through life. We confirm our faith in him. Confirmation allows us to say a public ‘yes’. Confirmation is also a sign of God’s gifts to us – his abundant gift of love. With the help of God we are given the grace to follow Jesus and to be nourished by sharing in the Eucharist. With the help of God we can live out the call to be life-long followers and learners and to serve both God and some of the many who have needs in our broken world. The Bishop is the minister at a confirmation service and these may be held in a cathedral or a church closer to home. The bishop’s presence links us to the church which is both world-wide and spans across the ages. At the confirmation service the candidates renew the promises made for them at baptism. The bishop lays his hands on each person with the words ‘Confirm O Lord, your servant with your Holy Spirit’. The Holy Spirit will enable the newly-confirmed to live a life of faith, help them to pray and to serve. 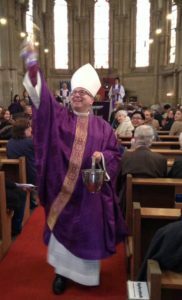 The bishop will also anoint each person with the oil (which was consecrated/ blessed at a special service on Maundy Thursday in Holy Week). This oil is a sign of blessing and calling. We are never too old to receive the gift of confirmation – to receive this gift of love from God. Aged 9 or 90 – God’s love is to be received and embraced. Confirmation requires thought, prayer and preparation. In this Team we try to do this in groups led by staff, for about six to eight sessions prior to the confirmation service. • Who was Jesus and why is his death/resurrection significant? • Why do the Creeds matter? • …… whatever else the group might want to discuss!! The course might include a mini pilgrimage or a special visit to a place of Christian importance. There are no tests except your willingness to continue. We are called to love God with all our heart, all our soul, all our mind, and all our strength. We will never understand everything of God, but we can understand some things and be willing to learn more, explore more, and grow more. When people ask to explore confirmation a group is formed and arrangements are made for the bishop to visit us here in our chaplaincy or to join the next service held in the area. Sometimes we might join with a cathedral confirmation, though this is unlikely. If you feel God is calling you to a deeper commitment in the Christian life then please make contact with Kara who would be delighted to help you take this joyful step on your journey of faith. ….may God’s grace empower you, Jesus’ love surround you and the Holy Spirit guide you on your journey of faith now and always…..